Have you ever wondered what facial recognition software sees when it registers your features and expressions? While a true answer to that question gives artificial intelligence a bit too much credit — it would have to be conscious in order to have a real opinion, so to speak, about your face — we can at least see how an algorithm would re-imagine your appearance. AI Portraits is a brand new website by Mauro Martino, director of IBM’s Visual AI Lab, that lets people upload their photos and see how well Martino’s AI algorithm does at creating a new digital painting of them. 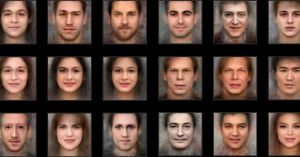 The website uses what’s called a Generative-Adversarial Network (GAN), a type of neural net AI that constantly checks its own work to create portraits so similar to your likeness that it would recognize them as a second photo of you. There were mixed results among Futurism staff, but the GAN did fairly well with my college graduation photo. The algorithm analyzed thousands of celebrities’ faces, specifically looking at their features. So if you have glasses or jewelry, the algorithm will re-imagine you without them. That might lead to some funky effects on your eyes. Beyond being a neat little tool, the portrait’s blending of various celebrity faces could finally help you decide who would play you in the movie about your life.